Tag Archive | "Winter fun in Sand Lake"
Snowmen come in all shapes, sizes, positions, and emotions. We’ve had an angry snowman, a somersaulting snowman, a drunk snowman, and now a snowman on a diet! 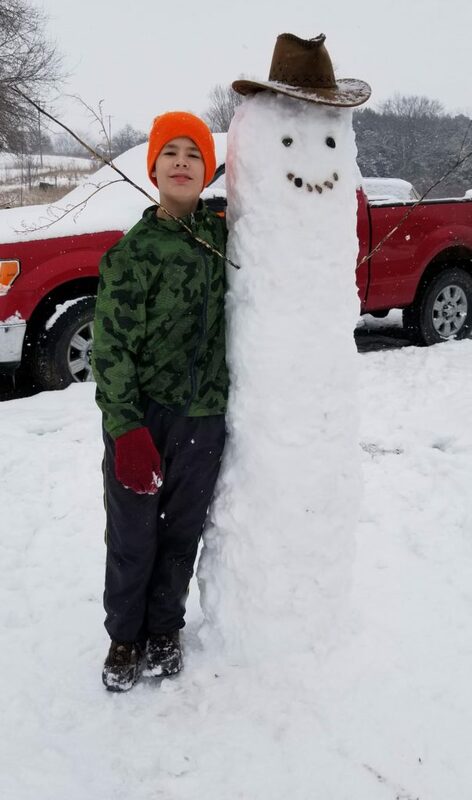 Ezra Ader, age 14, is shown here with Sam, the skinny snowman, who is over 5 feet tall. He was formed on January 23 near Sand Lake. Thank you to the Aders for their winter fun photo! If you have a snowman or winter fun photo you’d like to send us, you can email it to news@cedarspringspost.com and include some info about the photo—what’s happening, who is in the photo or who made what’s shown (names and ages), and what city/township you live in. We will print as space allows.